Prasiolite glistens with dazzling intensity in an exclusive design by Zayd Makarim. Also known as green amethyst, prasiolite acquires its green hue after amethyst is exposed to heat. 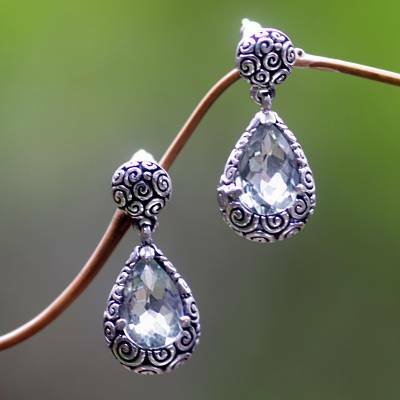 The 5.8 carats of faceted gems center teardrop earrings that are crafted by hand. The ornate patterns are inspired by the curls on the statues of Buddha in Borobudur Temple. You can find prasiolite dangle earrings 'Lime Teardrops' by Zayd Makarim in jewelry categories such as Prasiolite Earrings, Silver Earrings, Sterling Silver Earrings and Dangle Earrings. Enjoy exploring these sections for other Novica treasures.